Not only does your dental health affect the well-being and functionality of your teeth and gums, it has been closely linked with your overall wellness. Unfortunately, far too many people risk their health by postponing or avoiding the crucial care they need because of fear or anxiety. Regular visits to the dentist are simply too important to skip. We understand how dental phobia and fear of pain or judgment can prevent patients from visiting the dentist. Our highly trained and experienced sedation dentists, Dr. O’Leary and Dr. Peppler, are passionate about providing exceptional, gentle dental care in a comfortable and relaxing environment. If you’ve been postponing the important dental care you need because of fear or anxiety, please contact Meadows Dental Group today at 303-790-2323 to learn more about our gentle, patient-focused approach to dentistry. We happily welcome patients from Lone Tree, Centennial and Highlands Ranch. Our reputation as one of Colorado’s premier sedation dentistry providers has compelled people from across the state, from the farthest regions of Northern Colorado and Southern Colorado, to visit our clinic for exceptional, comfortable care. No matter what part of our great state in which you reside, we’re excited to meet you and meet all of your dental care needs. People don’t always look forward to visiting the dentist. In fact, many patients suffer from varying levels of dental anxiety and dental phobia. This can prevent them from getting the important and necessary general dentistry treatments they need. Sedation dentistry is designed to establish a calm and relaxed state for anxiety-sufferers through the use of safe and trusted techniques and sedatives. We also strive to create an environment that is completely non-judgmental. If your oral condition has deteriorated due to neglect over the years, we will never judge you or make you feel guilty. We focus on the present and the future, not the past. We are honored that you have trusted us to be your care provider and our primary concern is getting you healthy and back on track. Commonly known as laughing gas, nitrous oxide is a mild, non-addictive sedative that can help you feel more at ease during dental treatment. It is delivered gently through a comfortably-fitted nosepiece and is often used for a variety of procedures, from regular cleanings and examinations to more complex treatments. While the gas is being administered, you will breathe comfortably through your nose for a few minutes until you begin to feel the subtle effects of the sedative. You will notice yourself in a slightly altered state, but you will remain alert and able to respond to questions. Some people experience a mild feeling of euphoria from nitrous oxide, but most patients simply feel calm and relaxed. Once your procedure is complete, our sedation dentists will deliver oxygen through the nosepiece. All of the effects of the nitrous oxide should wear off in a matter of minutes. For anxious patients who want to achieve a more rested state than can be attained through the use of nitrous oxide, we happily offer oral sedation. For this popular and effective sedation method, you will be given a pill to take prior to your dental treatment to help calm your nerves so you can undergo your procedure comfortably and free of anxiety or fear. Additional pills may be given during the procedure depending on the patient and the length of treatment. Oral sedation is a perfectly safe sedation method, and our highly trained sedation dentists will closely monitor you throughout your treatment to ensure your total safety. Oral sedation has an amnesiac effect, so you may remember little to nothing about your appointment. It’s important to note that you will not be able to safely drive home following your appointment if you choose this sedation option; please arrange to have someone drive you to and from our office. If the prospect of dental treatment causes you to feel severely anxious or fearful, please discuss IV sedation with our dentist. IV sedation is our most powerful sedation option and involves the intravenous delivery of medication. A nurse anesthetist with over 25 years of experience works in conjunction with our two sedation dentists to administer medication through an IV attached to your arm. Your pulse, blood pressure and oxygen levels are continually monitored throughout the procedure to ensure your safety. Plan to have multiple general or cosmetic dentistry procedures performed in one visit. You will need to have someone pick you up from our office and stay with you at home for a few hours following this type of sedation. As experienced children’s dentists who see many pediatric patients, we know first-hand that dental visits can be a challenge for some children, whether due to fear, negative past experiences or difficulty tolerating certain treatments. 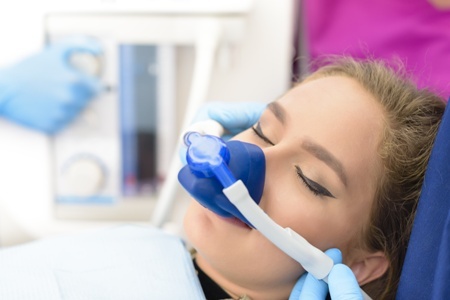 At Meadows Dental Group, our experienced sedation dentists, Dr. O’Leary and Dr. Peppler, offer nitrous oxide as a safe and effective pediatric sedation option. Nitrous oxide is the mildest form of sedation. Its gentle effects help many children feel calm enough to get the treatment they need without fear or unease. As with adults, the laughing gas is delivered comfortably through a nose mask. Once the treatment is complete, we administer oxygen through the nose mask and any lingering effects of the nitrous oxide subside within minutes. According to the American Dental Association, 22% of Americans forgo dental care because they are afraid of the dentist. Unfortunately, this can ultimately result in minor dental issues such as gingivitis escalating dramatically, and eventually requiring more extensive dental work and a perpetuated trauma associated with dental care. Our friendly team wants you to feel comfortable with dental care! While only a relatively small percentage of people suffer an unmanageable level of dental phobia, more people experience some level of anxiety associated with dental visits. The sedation dentists at Meadows Dental Group are highly trained and experienced at helping patients with varying levels of dental anxiety and phobia feel safe and calm while under our gentle care. We understand that there isn’t a one-size-fits-all panacea for dental anxiety, which is why we employ several methods to soothe our patients so they can get the crucial help they need. Avoiding the dentists can do more than just harm your oral health; it can have a systemic effect on your general well-being. Research by the American Dental Association indicates that dental issues may be associated with several other health issues such as heart disease, diabetes and more. We understand your anxiety and we are here to help. At our warm and welcoming office in Lone Tree, gentle dental care is more than just a slogan; it’s a cornerstone of our dental philosophy and the way our dentists serve patients every day. Whether you struggle with dental anxiety, are experiencing a dental emergency or simply want to feel comfortable during treatment, our sedation dentists will discuss all of your options and do everything possible to make you feel at ease during your visit. Discuss your treatment schedule: While some patients prefer to undergo a series of procedures in a single visit, others choose to schedule a series of treatments over a period of time. We will discuss every aspect of your dental care, including its scheduling to ensure you feel comfortable and confident with your treatment plan. Ensure you are numb: Before beginning your treatment, we take the time necessary to ensure the anesthetic has taken hold. We take every precaution to make sure your procedure is as painless as possible. Answer your questions: Open and honest communication is a fundamental principle of our mission. In order to provide the customized treatment you need and deserve, we work closely with you to understand your goals and answer all of your questions. Explain your options: Our dentists will never rush or pressure you into making a decision about your dental care. Our goal is to thoroughly explain your condition and educate you on all of your options. We strive to serve as your knowledgeable guides and help you determine which treatment option best fits your unique goals, budget and lifestyle. If you have found that it’s difficult to get numb for dental procedures in the past, the experienced sedation dentists at Meadows Dental Group can help. We understand the importance of reducing discomfort and are experienced at helping every patient, no matter their unique challenges, achieve comfortable, rewarding visits. We understand how difficult it can be to pursue the important treatment you need when you’re afraid of the dentist. 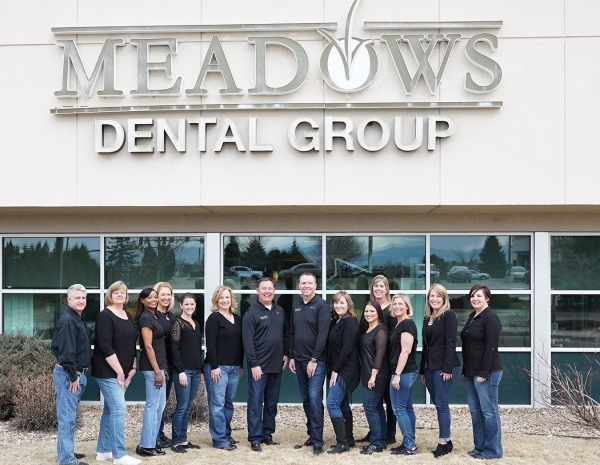 If you are ready to receive exceptional dental care in a comfortable, non-judgmental environment, please contact Meadows Dental Group today online or at 303-790-2323 to schedule a consultation. We proudly serve the Lone Tree, Centennial and Highlands Ranch areas of Colorado.